Assets being physical objects degrade in performance over time and are susceptible to unexpected damage or failure. To ensure their continued and reliable operation, it is imperative to conduct preventative measures on the assets that you manage for your customers, also helping to eliminate downtime and undue asset damage costs. Due to the fact that a maintenance plan is comprised of these separate components, you enjoy the ability to create standardised schedules applicable at one or many different locations, forcing consistency and assuredness in the work that will be performed. 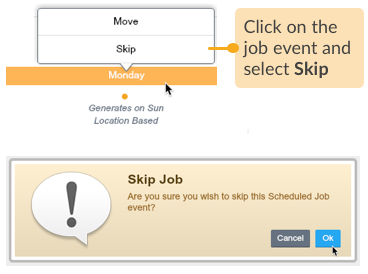 Once a schedule has been applied to a location, thereby executing the maintenance plan, you can view the planned job events, per site or per asset, including the ability to move or skip each event as necessary. Asset types that require recurring maintenance are created in Loc8. To know more about creating asset types, please read Create Asset Type. The locations where the maintenance is to occur have been added as sites in Loc8. The applicable tasks have been created as task templates. To know more about creating task template, please read Create Task Template. 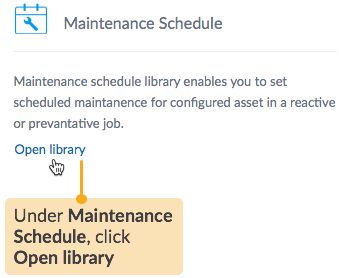 STEP 1 Go to the Maintenance Schedule page accessed through the Libraries tab. 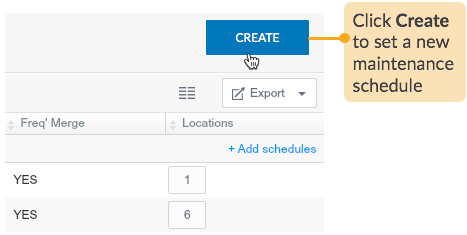 STEP 2 Open the maintenance schedule creation wizard. STEP 3 Set up the maintenance schedule with a suitable name or code, one that other users can easily identify and use in future. Next, define the frequency at which planned jobs will be created with tasks for the specified asset types. This method will create one job with tasks for multiple assets at any location where the schedule is applied. The example below shows the job created using this method. 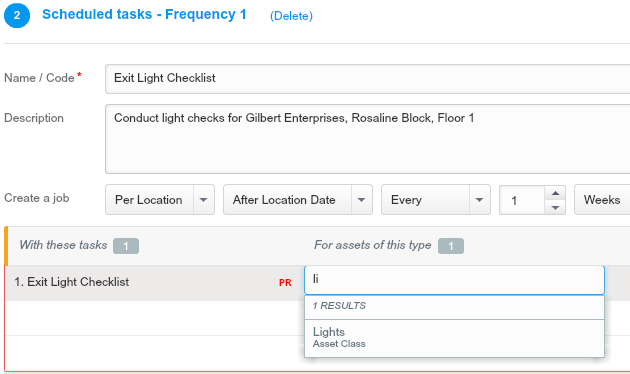 You will see that the task 'Exit Light Checklist' gets added for two assets - 'LED Exit Light' and 'Dual Head Emergency Lights', which are of the selected asset type 'Lights'. 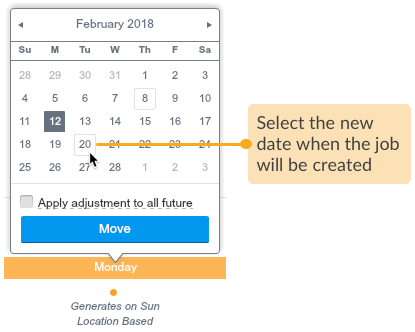 You must specify the frequency for creating jobs either before, after or on a date that's defined per-assigned-location (we will see how to set the location date in section Updating Maintenance Start Date). This method will create one job per asset at any location where the schedule is applied. The example below shows two separate jobs created using this method. Two jobs each for the two assets - 'AC compressor' and 'AC Compressor High' which are of the selected asset type 'Air Conditioner'. NOTE: You may choose to merge multiple asset-based jobs into a single job (scheduled per active location) when the jobs occur within the specified merging timeframe. 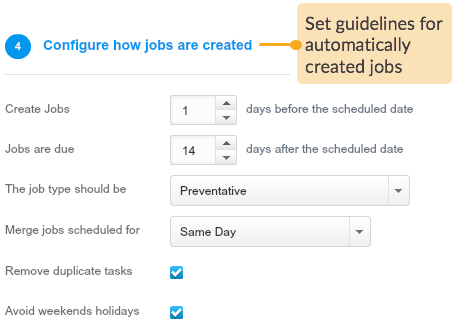 We will see how to enable merging in section Configure how jobs are created by the schedule. In this method, jobs will be created automatically after each asset's Maintenance Starts date. You can check the Maintenance Starts date on the asset's profile. By default, the maintenance start date of an asset is when the asset was created, provided, the location of that asset is already activated to run maintenance schedule. After having selected the preferred method for scheduling jobs (i.e. 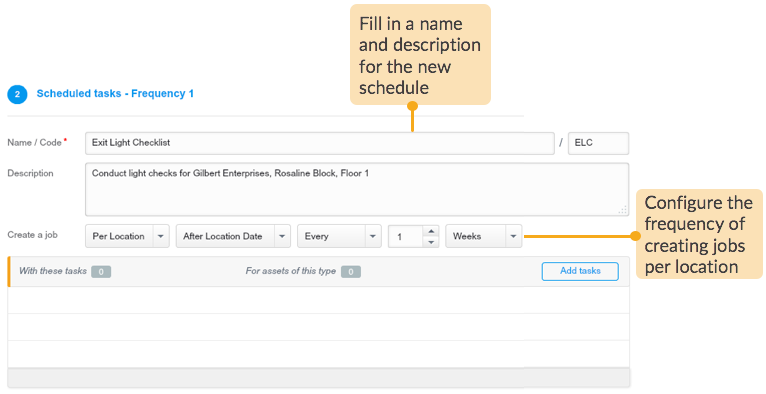 either by location or per asset), proceed to adding tasks and the required asset types. When adding tasks, select one or more tasks from existing task templates. Specify the asset type for each added task. 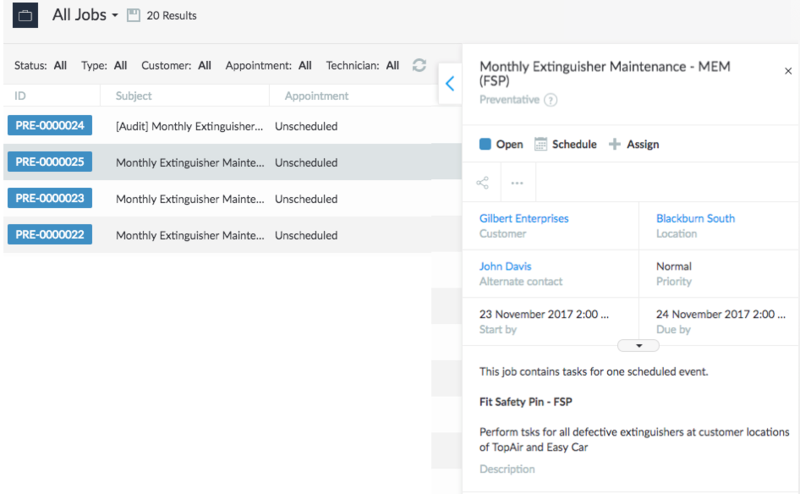 Within this one maintenance schedule, you can schedule additional jobs to be created at some other frequencies, with a different set of tasks and asset types. Click Add another schedule frequency. NOTE: The selected tasks will always apply to all assets of the specified asset type, but from which date onwards will it apply to each asset can be selectively handled using the maintenance start dates as explained in Update Maintenance Start date. Till this point, you have set up the new maintenance schedule. The next step is to configure how jobs are created by the schedule. STEP 4 Specify when and in what way would you like the maintenance schedule to create jobs for you. If you apply job merging using Merge jobs scheduled for, multiple jobs will be merged into a single job if they occur within the specified merging window. This assists enormously with minimising unnecessary repeat visits to a location. With that you have completed setting up the criteria for creating scheduled jobs. STEP 5 As described on screen, after setting up the maintenance schedule, go to the next screen to select the customer locations where this particular maintenance schedule should run. NOTE: Assets are automatically added to any applicable schedules when they are created or modified, so even if there are no assets of a particular type at a location now, jobs will be created when they are added in future. Click Add Locations on the top-right corner of your screen. Select the required customer locations (sites, buildings, rooms or floors). INFO: The first column in the site selection page shown above displays the Reference field value as was entered in that particular site's profile. 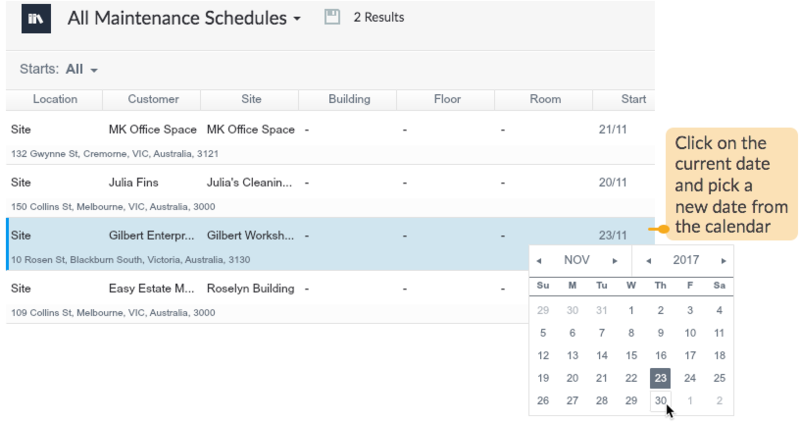 On selecting a schedule, the event viewer at the bottom of your screen calculates and prompts the dates when the jobs will be automatically generated. NOTE: The asset-based prompts will only appear for active locations, and in newly activated locations they may take a few minutes to appear. From the event viewer, you can choose to move a job event as well as all other job events of the same frequency. If a particular job event is not applicable, you can choose to skip it, and so the job for that event will not be created. STEP 6 Set the maintenance start date from when jobs should be auto-generated. 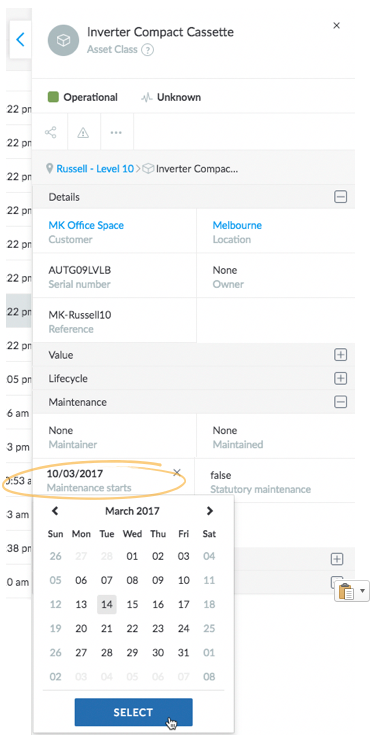 You can make adjustments to two types of maintenance start dates - one on each location and the other on each asset - to better define when and for which assets should the maintenance schedule start creating jobs. If you are already in the maintenance schedule's Locations page, go ahead and update the Start date. 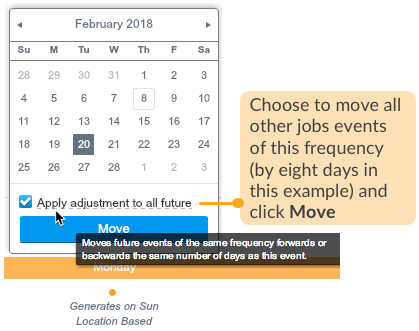 Where a schedule frequency is set to Per Location, jobs will be created according to the date set on the location exclusively. For example, if the frequency was 'Monthly', job will be created monthly from this date, for all assets at each location. Where a schedule frequency is set to Per Asset, jobs will be created per-asset according to the Maintenance Starts date as specified on each asset (read the next section to know more), but never before the Start date as specified on each location. 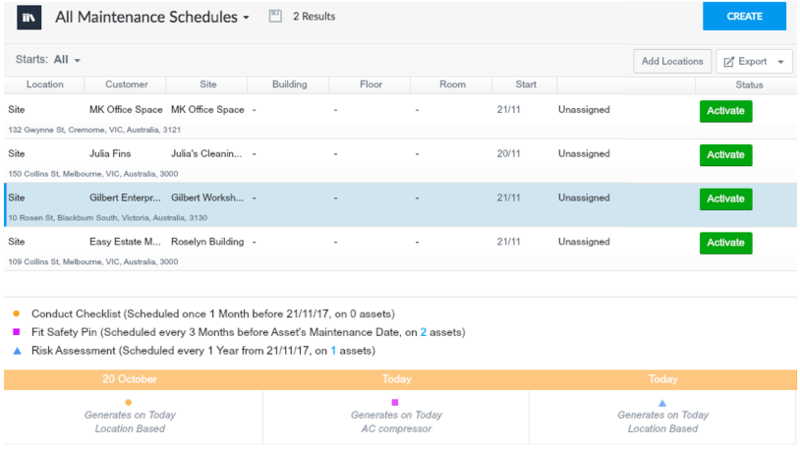 Navigate to the Assets area, and select the required asset to access the Maintenance Starts date on the asset inspector. STEP 7 You can choose either Location Maintainer (the same person who maintains the site. 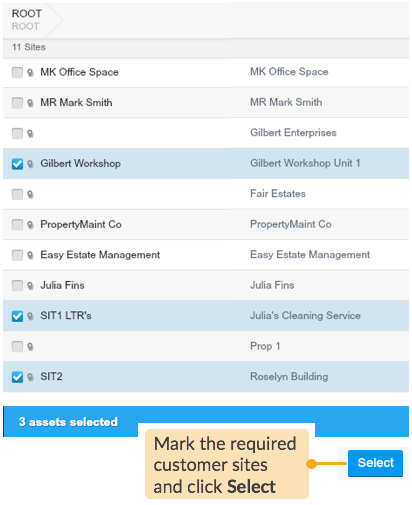 To view the Maintainer, go to Assets tab > select the site > view the Maintainer field in the site inspector), or select relevant technicians who on receiving notifications for the newly created job in their Loc8 Mobile app (and email addresses), can action them as appropriate. STEP 8 Once you are happy with the maintenance start date and the users involved, you can activate the maintenance schedule. 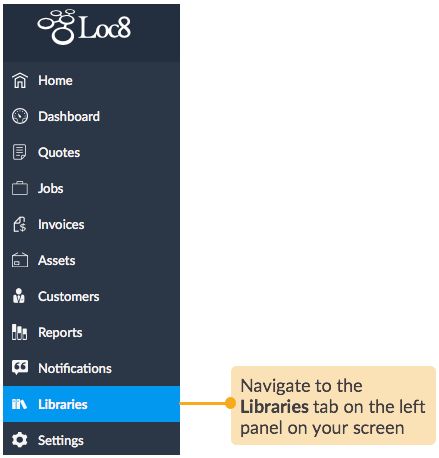 On activating a maintenance schedule for the first time, you may choose to allow Loc8 to create the first audit job for you if you perform an initial audit at the customer site before starting the actual work. Now when you go to the Jobs area, a list of auto-generated jobs will appear corresponding to the maintenance start dates and the frequency of scheduled tasks. All done! Just set the appointment date and time, and the jobs are ready to dispatch.